Firefox is launching a new experimental browser extension called Advance, which recommends new websites and articles based on what you’re currently reading and your recent browsing history. Firefox experiment suggests articles based on your web historyYou can flag and block articles you don't want, so you'll ideally refine your results over time to get only the content you'd actually care to see. And Mozilla, the privacy advocate that it is, knows that the recommendation system may make some people uncomfortable. 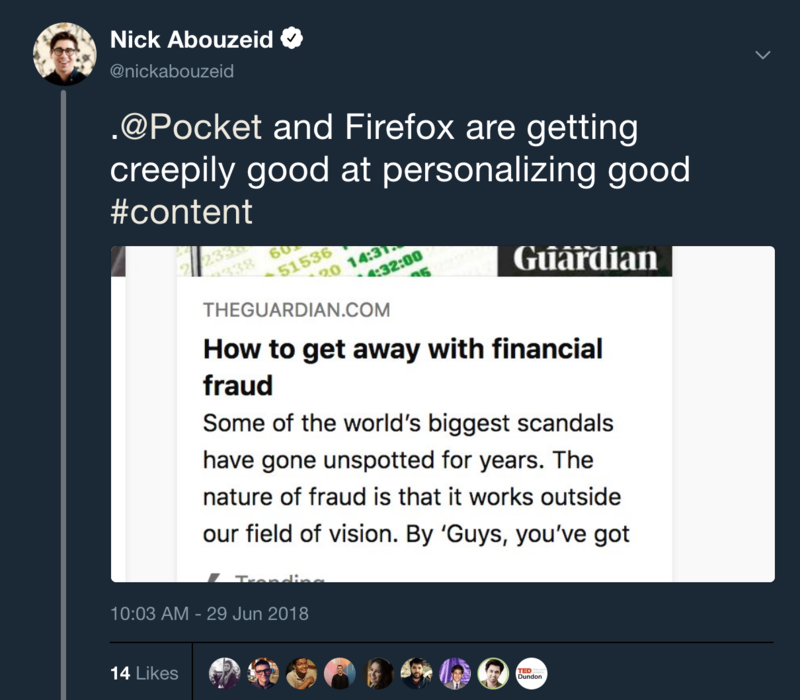 Firefox's latest experiment recommends stories based on your browsing historyFirefox is launching a new experimental browser extension called Advance, which recommends new websites and articles based on what you're currently reading and your recent browsing history. There are two parts to Advance: a "Read Next" section, which recommends related articles based on your current tab, and a broader "For You" section, which uses your recent history to populate its recommendations. Would you recommend Firefox Advance to a friend? This is next level ad retargeting. So many people are concerned with privacy and security. Personally, I would avoid this as the benefit < risk, for me. 1. I think people are over hyping the concern. It's opt-in. 2. The data is containerized from the notes, that it's only page aware. 3. Really? Facebook and Google and the like deploy hundreds or thumbprint techniques without telling us, the moment we have a company transparent about what they're doing it's too much? @kay0stheory I sense that's why it's also beta. It's really hard to do curation with small data... for now. Personally, I am fine if people know what I read if it means better content. The constant barrage of irrelevant information is much more of a struggle for me than hyper-targeted ads I rarely spend time/money looking at. This looks really cool honestly and like something that would come in handy when doing online research BUT what about privacy? I mean Mozilla is an advocate of online privacy, they make extensions like the Facebook container and write relevant articles on their blog but then they release something like this? I have to look more into it, perhaps it's not account based but rather recommends related articles only based on the article you're reading and doesn't keep any history records. That could be possible if they leverage Pocket's database to make recommendations and then offer them to non Pocket users without tracking them. Reading is hard. Listen to articles instead.